We’ve learned never go outside without our handy key chain pocket-sized UDAP spray or the pen spray. We actually mounted Velcro strips buy each door to the outside to “stick” one of our larger UDAP cans there for easy access. In bear county like this, we never go around the corner of the house without making very audible, very human noises – whistling singing talking loudly to our selves- as we’d rather a bear run away from our approach than be surprised by us. 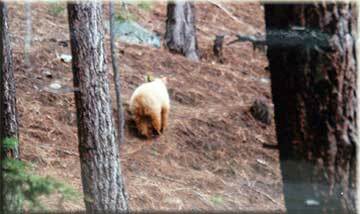 Even so, we’ve had innumerable “close encounters” with bears simply by our proximity to there stomping grounds… which happens to be just outside our property lines on three sides…National Forest. In general, we do not fear black bears as much as they fear us. They typically do all they can to avoid human contact; but they really love human garbage! The bear tooth punctures in our garbage cans and the occasional garbage spread over our driveway and yard to attest to that. This summer, we’ve had to deal with an adolescent male bear with a very “blonde” coat. (And you know what they say about blondes…!) This bear somehow missed out on the “stay away from humans” gene! Your UDAP pepper power® has therefore become invaluable – not only for our safety, but also for his remaining in the bear gene pool! 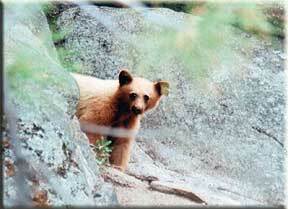 In the Lake Tahoe area, bears who are in identified as a nuisance have there ear tagged. If a bear tagged is caught as being a nuisance again. It is typically “put down.” No one around here wants that. We actually like seeing our beautiful black bears… but only at a respectable distance! And leave our garbage alone, thank you!!! Its pretty well agreed that once a bear finds easy and tasty food somewhere… he remembers and returns regularly – even year-to-year. W e’ve found that your bear spray is an effective and long term behavior modification tool. The forest service has actually hired “behavior modification experts” to teach bears to stay away by yelling, “Bad Bear!! !” and throwing rocks at bears around garbage cans and dumpsters. 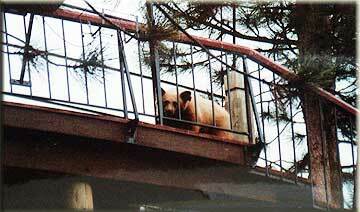 And yup… the bears run away from such abuse. But… there back as soon as that mean and loud human is gone. To describe our bear spray incident, I must first explain that we have screen doors that retract into the door frame when pulled from their magnetic closure system. Unbeknownst to us, some bears have evidently learned that a well placed nose nudge on such screen doors will activate the screen’s retract mechanism, thereby opening their way into our home!! Having inadvertently left only the screen door closed one day while we drove off on a quick errand, we were quite surprised on our return to find some curious objects on our kitchen floor… namely, two cans of frosting (one chocolate, one vanilla) one can of macadamia nuts, and several oranges. 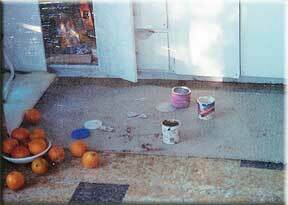 The cans seemed to be messily licked clean; the oranges looked chewed and stepped on! Hun?? 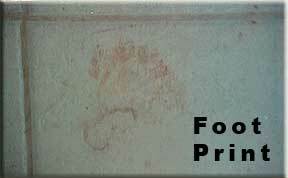 An approximately 175 pound frosting footed bear was, at that instant, re-entering our bedroom door for more!!! Charles was face-to-face about 4 feet from the bear. Aiming the UDAP spray directly in the bear’s face that bear got the rudest welcome he’d ever had… or, obviously, ever WANTS to have!! 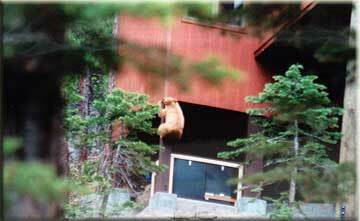 In a cloud of orange agony, the bear basically PIVOTED mid-air endeavoring to exit out the door as fast as he could – to escape that noxious spray, making frantic gagging, and coughing-type noises. He leapt up the hill about where he stopped, head down – obviously trying to catch his breath before he could go on. 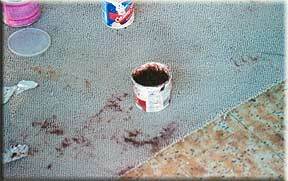 Charles, however, was right on his path, yelling and emptying the can on him. The bear took one look at his tormentor (the can of spray, that is!) and took off again up the hill. Huge and lumbering as bears may seem when foraging like “nice” bears. (! )… It’s amazing how agile and fast they can be when they choose to leave in a hurry! From our kitchen window, we saw him stop several more times in his RUN up the mountain… shaking his head and obviously in extreme distress from the spray. We have had no repeat performances; Mr. Bear hasn’t been back… and it’s been about 6 weeks now. For awhile, we thought he’d been “taking care of” by the authorities for other encroachments. But just this week, we spoke with several neighbors about 2 blocks up the street and they’ve seen our blonde chocoholic bear numerous times. We figure he just doesn’t like us and our orange stuff anymore!!! We figure we have you to thank for that! By our reckoning, you have saved Mr. Bear’s life and Charles’ life. We’re happy for both. So thank you! We’re eternally thankful and will remain continual braggers and promoters of your great UDAP pepper power®! !